The Bluetick Coonhound's most distinguishable trait is its blueish coat. The long pendent Coonhound ears and rectangular muzzle make it a handsome dog. Bluetick Coonhounds have long muscular legs and cat-like feet with arched toes. The Bluetick Coonhound originated in the southern US. The Bluetick Coonhound has a unique tri-colored coat. In reality the coat is heavily black speckled (or black ticks) on white which gives the coat a blueish tint. The Bluetick Coonhound requires only regular brushings. This breed's ears should be checked regularly to ensure they are infection free. Bluetick Coonhounds are social and wonderful companions that are devoted to their families. This dog breed should not be trusted with non-canine pets as their hunting instinct is too strong. Bluetick Coondogs are excellent at treeing raccoons and often take part in trials to test their skill at this activity. Bluetick Coonhounds are alert and able to work in all terrain situations. Each Bluetick Coonhound has a distinct voice that is recognizable to his or her owner. Bluetick Coonhounds tend to drool and slobber. Bluetick Coonhounds are prone to hip dysplasia, cataracts and Krabbes disease. The Bluetick Coonhound can be expected to live about 11 to 12 years. Bluetick Coonhounds are not suited for apartment life as they require at least a large yard to keep them active and content. This dog breed should not be left off its lead unless it is in a safe enclosed space; otherwise, if it catches wind of a scent, it may follow it for hours. The Bluetick Coonhound is in the Hound group. 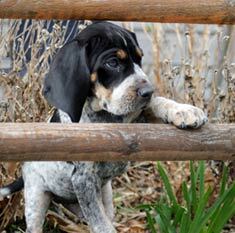 Find Bluetick Coonhound Puppies with our Free Breeder search!